Given the injury-related expenses, lost wages, and medical bills you have to deal with, you should not have to worry about the cost of our legal services. Our firm's policy of accepting cases on a contingency-fee basis means you owe NO attorneys' fees unless you recover money damages in a settlement or jury award. Evening appointments are available, as are home or hospital visits for those whose injuries prevent them from traveling. We offer a FREE initial consultation for potential clients and handle all personal injury cases on a contingency-fee basis. This means you owe no attorney fees unless my firm recovers compensation for you. Most of the cases we see come through our office involve car accidents. 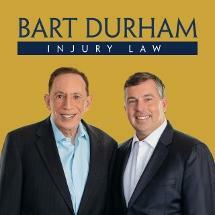 The Law Office of Bart Durham is well known for securing compensation for clients injured in a tractor trailer accident. We have represented clients who were prepared for a new child, but not prepared for medical negligence that left their newborn and/or the mother with a birth injury. A serious injury can include a spinal injury, brain injury, back injury, burn injury, paralysis, chronic pain, permanent scarring, or loss of a limb. Wrongful death cases are emotionally-charged. Grieving family members are not at their best and do not always make the best decision. This is where I come in.